February 21 came out of nowhere. 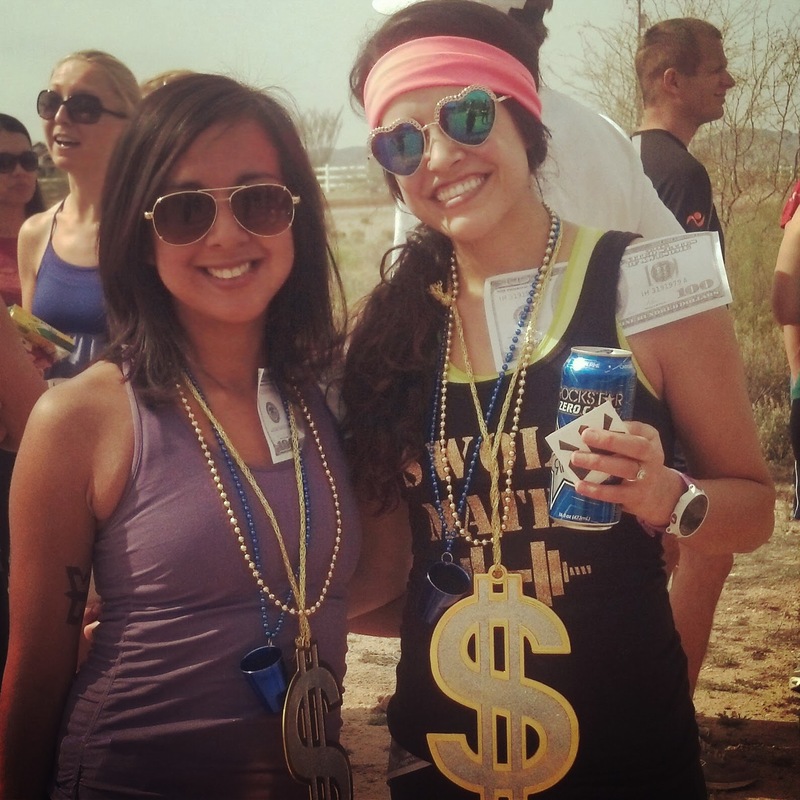 I had been training for Ragnar Del Sol for a few months, but it still seemed so far away. Suddenly it was a week before Ragnar and I had a list of things to do and buy. 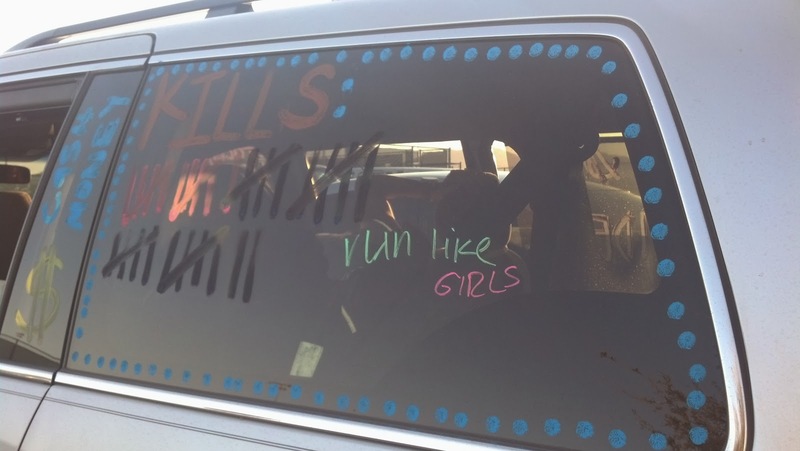 The night before Ragnar we decorated our vans with window paint and packed some our belongings. One of my teammates was sweet enough to bake carrot cupcakes for the birthday girls on our team. I finally went to bed around 11 p.m., setting my alarm for 2:30 a.m. By 2 a.m. I was wide awake. I decided I might as well get up and moving. 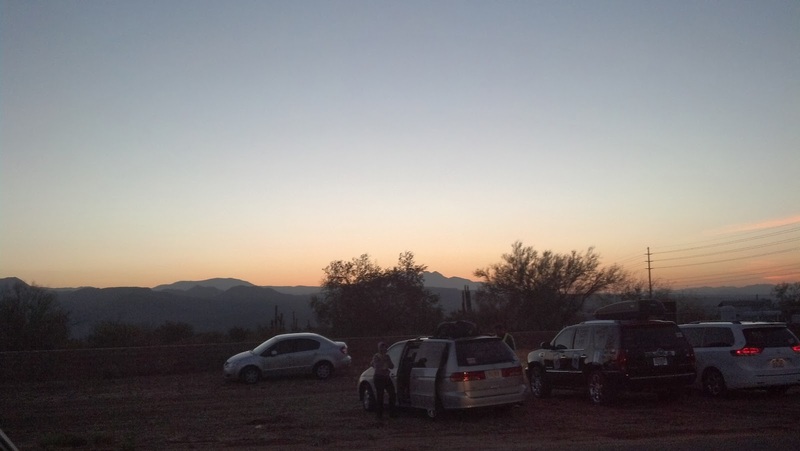 My vanmates picked me up at 3 a.m., and we were on our way to Wickenburg for our 5:30 a.m. start. I was Runner 5 again this year, which was nice because I knew what to expect from my legs. Photo by Ashley of PerfectleyPeared.com. 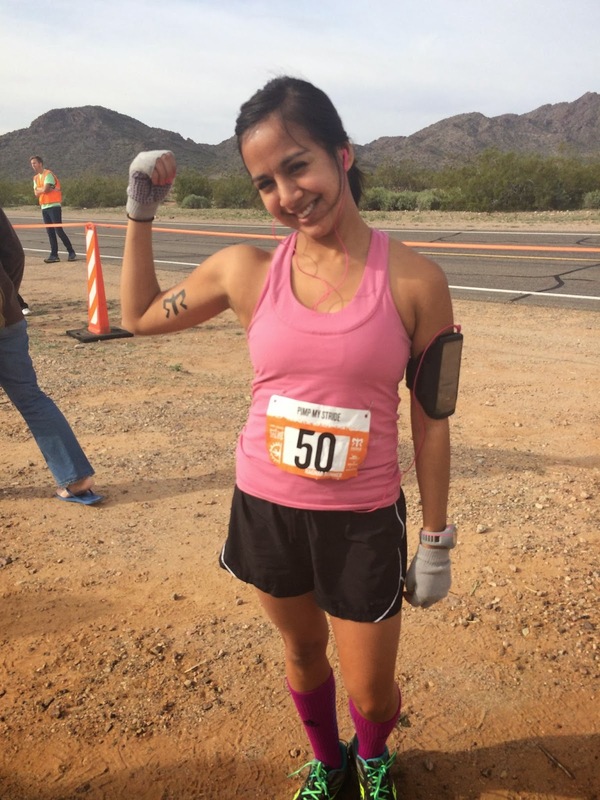 With my Ragnar tattoo, I was ready to take on my first leg. I ended the 6.7-mile run with 10 kills under my belt and a pace faster than last year. We met up with our team members at Exchange 6, where we were finally able to bust out our themed swag. After our exchange we went to Willow Canyon High School to rest up before our second legs. My teammates were eager to try some yoga, so I led a short session for them on the football field. We also used the time to try to nap (which didn’t happen), eat and clean up. Before long it was our turn to run again. My second leg started around 11:30 p.m. 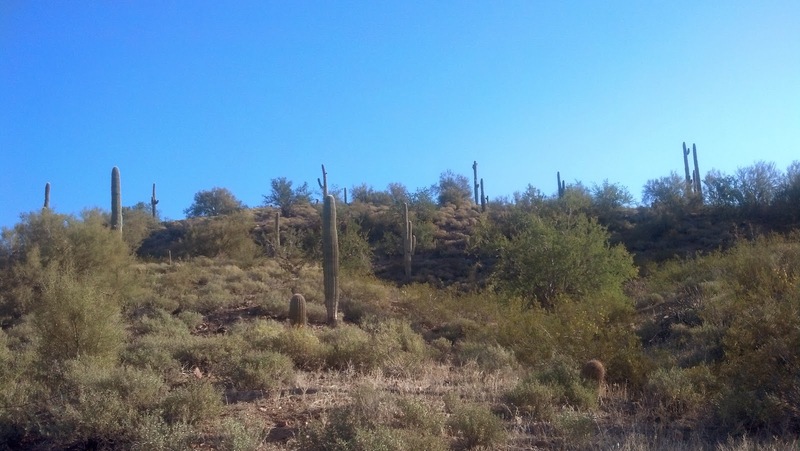 It began on the west side of Interstate 17, crossed over the freeway on the pedestrian bridge and continued on a dirt trail along the canal and through a neighborhood in north Phoenix. I was nervous about this leg because last year I couldn’t tell where the trail was at first and had to wait for another runner to follow. Blinking red lights and signs made the trail more visible this year, so I didn’t have any problems. There was also a volunteer to remind me when it was time to hop over a gate on the course and another volunteer was at the end of the dirt trail to radio that I had made it out safely. “Welcome back, 50,” he said. From there I was quite lonely for a bit. I didn’t see many runners on this leg until I neared the next exchange. My phone started to die, so I turned off my music for the last 3 miles. It wasn’t long before I heard coyotes howling to the east. I was more curious about where they were than afraid. The night run was my favorite leg despite only having one kill. It’s the stars, the solitude and the cool air. It was a precious miracle that I was able to get an hour or more of sleep in the van after our next exchange. I woke up to the sound of a door slamming (thanks, teammate) and the news that it was soon our turn to run again. I was slightly jealous of our first runners, because they could enjoy the sunrise views along their run. 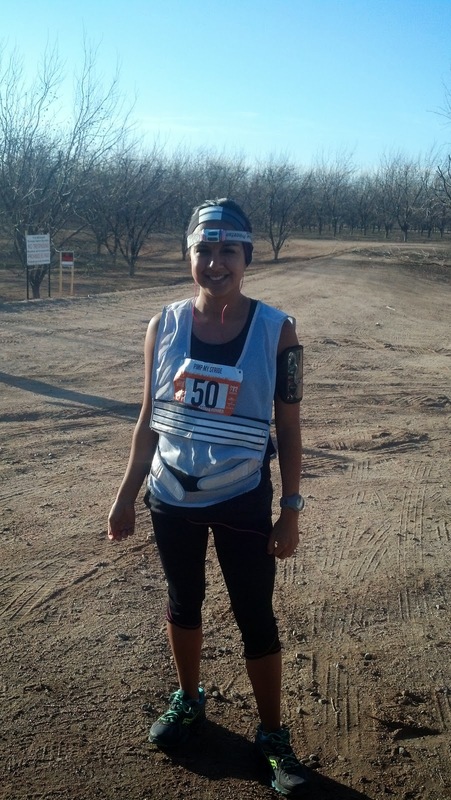 I started running around 8:30 a.m., so I still had to wear the reflective vest, taillight and headlamp. I was less than thrilled about it, but I survived. The views of the McDowell Mountain area more than made up for it. I stopped to take some photos during my hilly, 4.7-mile run. I also chatted briefly with our team volunteer at the water station. The sign I was looking for was on a hill, of course. But it was soon time to head to Tempe to wait for Van 2 and cross the finish line as a team. 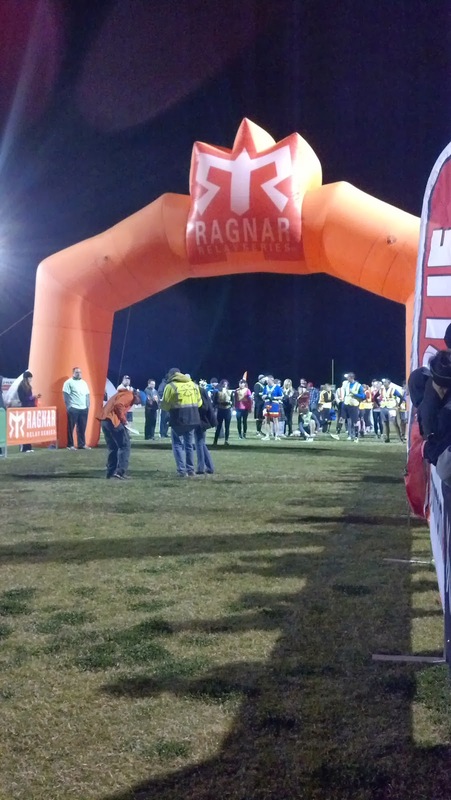 As I recovered the next day from the relay I found myself thinking that I want to do more miles if I do another Ragnar next year. Can’t wait!